The Japanese exported version of this record is really only worth the money for serious collectors and completionists. "nu-Nr6d" is similar to "Paralel Suns" in that it's a very subdued ambient track. In some way, the flourishes here seem like they would have enhanced the actual album well. This Album could have been much better with a better selection of the musics to be included in this Album, so many tracks included with different tunes that it compromises some of its coherence, nevertheless it turns out to be a satisfying release after many attempts to assemble its content...still some tracks sound aggressive and distressing to my ears. My top track is "Paralel Suns" witch is absolutely amazing and impressive, it places me before giant Temples falling apart , also i love "Altibzz" which is very melodic and makes me fly over a vast landscape,"Rale" with its dark tune , "Notwo" witch is like a mysterious force growing, and "Outh9x" that makes me imagine a forgotten surreal temple immersed in deep fog during daylight. This edition is by far the biggest low point in the history of Warp's music catalogue. After the obligatory music changes which happen every decade (in the 00's it was the year 2003) Warp lost their edge as a cult label by signing stupid indie-rock bands and letting their main masterminds (Autechre, Squarepusher, Nightmares On Wax) release disputable albums in terms of progressive music. Well at least we have Chris Clark who managed to be something like a new Aphex Twin mixed with Thom Yorke. Between 2005 and 2009 Warp managed to release only two memorable groundbreaking releases limiting them tw only 1000 pieces. The first one is imho the best mix by Surgeon ever released called "This Is For You Shits" showing how modern techno should sound and not fearing to mix in some classic industrial and power electronic acts. The second one is this release. Well the standard issue contained some fine and and interesting pieces like the fantastic ambient track "Altibzz" (a welcome return to Autechres ambient roots), the dynamic "IO" or the detroitesque "chenc9". The later two tracks allready appeard in slightly differnt version in Autechres live sets dating back to 2005 (see the Montreal or Glasgow bootlegs from 2005) which also makes the term "new material" questionable. But the standard issue has futher problems. A big part of the tracks are more like sketches of ideas, the more interesting tracks, as mentioned above, are too short. Go to Bleeps webpage, download the tracksnippets with an online mp3 grabber, put the tracks on a cd and you have the same effect as on the standard issue of Quaristice. But lets be honest: how often do we listen to Autechres tracks from albums like Draft, Untilted, and Confield from start to end? The second "Versions" bonus disc works much better as an album, expanding some of the stronger tracks to "full versions" and showing how a standard Issue of this album should sound like. But only the lucky 1000 people owning this special edition will hear the full album. Well, the question still remains: why did Warp made this special edition and limted it to 1000 pieces? Is it because of the manufacturing costs of the beautiful steel package? I don't recall that similar packed albums (PiLs second album for example) needed to be this limited. Is it because that this edition should be a piece of art? Obviously yes. But do we need in times of stupid music, digitally available everywhere, such special editions? Should music like this one found on the Quaristice Versions cd be available to more people, teaching them how modern IDM should sound like. I guess everybody has a different answer to this question. As an Autechre fan (and there are definitelly more than 1000), I personally feel apaled. Special, limted or even sacred editions by genius musicians are a not a good sales-policy (a fact which always ennerved me regarding COILs work of art). This is not the time for special editions, this is the time to make great music accessible to everyone, to show todays kids how music can and should sound. And good music will never loose its special value, even if it is available to everybody. Hearing after Hearing and listening after listening, looking at much more recent Ae release from 2010 and 2011 i strongly came to finally get this magnificent piece of work and got forced to leave a review because this is on my opinio the best Album Autechre have done in last years, and is not easy to overcome. Here the strenght is the lenght of music and its variety in a "pastiche-like" work so that's Quaristice: a full immersion journey into electronic digital landscape that needs all the listener deep attention and deserves heavy beat moments with good inventivness, sometimes with a feeling looking at the past synth electronica from the 80' and most of the moments delivering a re-newed Ae modern unique feeling of music, this wide unknow spacey event that fills into silence wich our duo Booth and Brown always know how to raise and maintain. If we put near this album the Qauaristice.Quadrange Ep we have a full gift from the band, a real physical pleasure i must admit, a massive bunch of tingling nerves music with the omnious Perlence Subrange 6-36 track of 58 minutes of mental come and go blippering wich industrialize our sense of hearing with different versions of album tracks: a good idea wich should be more thought from the bands around because this thing broke away our usual feeling of the "same thing" on and on. I'm sure Quaristice is a point of arrival, a sum of their carrer at mid point of synthesis along the way they have started togheter: many billions of mind-head are in their hands down to their fingers, awaiting to be musically educated by Autechre, this apolitical project of liberation of the mind trought Electronic Music, the technology at human service and NOT the contrary. Still the Best and, Unrepeated. I just love the artwork for this release. Excellent job, Designer's Republic. Listening to Autechre albums from start to finish with a little understanding of music technology and its evolution over the past 18 years, you kind of get a sense for these two lads. While admitting they really don't know what they are doing in a classical music sense, they have always pushed their gear and the limitations of electronic music and to wonderful affect. From hacking ensoniq samplers to learning software like max/msp, they have pushed the limits most other artists felt comfortable with and thus a lot of listener's comfort limits. At times they create the most beautiful and otherworldy soundscapes and at times create the most isolatingly cold calculated digital sound scapes, like music a schizophrenic AI might calculate. Quaristice is the culmination of nearly 20 years of growth and push towards the outer limits of music technology and experimentation. They seem to have reached a comfort level (for the time being) with music technology and this album showcases this level of artistic comfort. It "feels" as though they have really reached a point where they have explored and isolated enough sonic avenues, and now they share with us an assortment of paths, melodic, percussive and somewhat odd yet entirely musical pieces. The majorty of tracks are short at pop song length or less, but you get the "ideas" with each track, and each track is, in essence, a different idea. This is where their mastery shines through. They show us what can be done with it all. From lovely melodic to calculated percussion and points in between. Old sounds mashed with new. In a quickly and easily digested "information age" format. While listening to this album Im consequently reminded of all the elements I have come to love about their sound and all of the elements I have yet to really understand or feel, yet somehow they mix and match just enough, to make me feel like the bumpy road that has been Autechre's discography has led to something great. 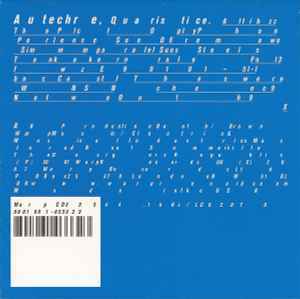 IF you listen to Autechre, from their first album to their last and really try and understand that this is essentially a life sentence of dedication to exploration of electronic music and the technology available to make it over the past 20 years, you will really understand this album and have a better understanding of some of their "harder to listen to" works and maybe "get" their ideas now. The growth in computing power from the early 90s up to now has been staggering, in both computers and electronic instruments. Autechre and few other artists have kept pace with this tech curve and that is an act of pure genius in itself. To make these frontier sounds musical and at times emotionally/creatively charged is just amazing. Autechre does this, and does it very well. Autechre have been around since the early days of IDM, and from the sounds of "Altibzz," it may seem that _Quaristice_ has returned to those days. But the angular tones and skittering rhythms of "The Plc" set us back firmly in the future. If anything, I think Autechre has gotten more industrial in their music-making. Certainly, they have never been wedded to passing fads, so the deep space ambience of "Paralel Suns" should come as no surprise pressed up against the robotic romance of "Simmm" and the pure abstraction of "Steels." The metallic percussion of "Tankakern" and the angry machinery of "Fol3" show a real turn towards the original concept of industrial music. The tubular tones of "Wnsn" has a wistfulness to them, a small expression of emotion in an otherwise sterile album; "Chenc9," as well, shows off a little personality. The ambient "Notwo" and "Outh9x" carry off the album gracefully. Perhaps the future of Autechre is already here. Autechre never went 100% digital, and never before has this been as evident as on Quaristice. What Ae has done more often than not is run an arsenal of basic old-school equipment with a Max/MSP brain. The melancholy analog synths of classic releases like Amber and Incunabula, and early Aphex Twin, make their return here, as do moments of broken late-80s electro and classic drum machine sounds. Nevertheless Booth & Brown have as always sharpened their digital ambient-glitch blades on this release, here so much that their awesomely daring collaborations with the Hafler Trio are somewhat less surprising. Yet they've allowed their old equipment to breathe in these tracks, introducing elements of daring familiarity. Ae's beats, since their software phase began, have had a spastic, irregular stimulus that many have found irritatingly arrythmic, and others have found positively exhilirating. The familiar elements of this release may convince the former listeners by offering clearer reference points in conventional techno sounds. It's hard to believe that Sean Booth and Rob Brown have been experimenting with sound for over 16 years now, ever since their first release, Incunabula, on Warp Records. It is perhaps their unique programming approach to analog synths, custom Max/MSP patches, micro granular effects, and mathematical rhythms, that pushed the envelope of sound exploration to the common studio techniques of today. Can the UK duo continue and reinvent the sound? I'm on my fifth listen of Quaristice, Autechre's 9th album, and the definitive answer is: yes. The twenty tracks on a digital release which I snatched from bleep (including exclusive artwork for each track! ), maintain the indisputably unique Autechre sound. The beats are still chopped, the sound waves decomposed, and the structure erratically twisted. But unlike Autechre's previous LP, Untilted, this 2008 release is warmer, less noisier, and at times even melodic (there are even strings buried deep in one of the tracks). The genre starts to glide closer to abstract and minimal ambient, with an occasional glitchy quality of other worldliness. If by some miracle this is your first Autechre experience, brace yourself for a unique and unforgettable experience, if you can hold on. For the rest of us, it's just a necessity for our complete anthology. Too bad that the special, limited to 1000 copies edition, with an additional CD and a photo-etched steel casing sold out within the first 12 hours of announcement.